Athens exudes a unique charm through its mix of street markets, vine-covered tavernas, souvenir stalls, ancient monuments and high-rise buildings. For tourists, a plus is that most of the capital's attractions are accessible by foot. Athens was named after Athena, the Greek goddess of wisdom. According to mythology, she won the city after duelling against Poseidon, god of the sea. 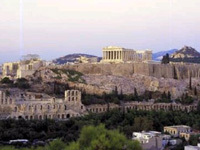 Indeed, Athens can chart its history back thousands of years and is regarded as the cradle of Western civilisation. More specifically, it's democracy's birthplace, and where philosophy, art and architecture were refined. The city declined after the Classical Age, dwindling to nothing but a town in the colourful area now known as the Plaka. It emerged as independent Greece's capital in 1834. Today, the city is bustling. And though the pollution, frantic gridlock and dingy buildings are a striking contrast to the open beauty of Greece's coast and islands, Athens is truly the country's beating heart. Ancient wonders like the Acropolis, the Parthenon, and the Temples of Zeus and Hephaestus ensure that the city will always lure travellers.